Imagine living in a home with $0 energy bills. Sound far-fetched? While the technology may be a few years away, S&A Homes, along with the Pittsburgh-based IBACOS group are teaming up in the Cobblestone community in Ohio Township, PA to create a livable home that utilizes renewable energy sources and the latest technologies to produce as much energy as it consumes, creating a “net zero” energy home. The project, expected to be completed in late 2010 will simulate a real family living in the home to monitor energy usage and provide useful data that can be used to develop new products and eventually integrate such technologies into the home of tomorrow. The project is expected to set the bar for future homebuilders in terms of combining energy efficient features with a comfortable and affordable home. Click here for more information on the Nation’s First Zero Energy Lab Home. 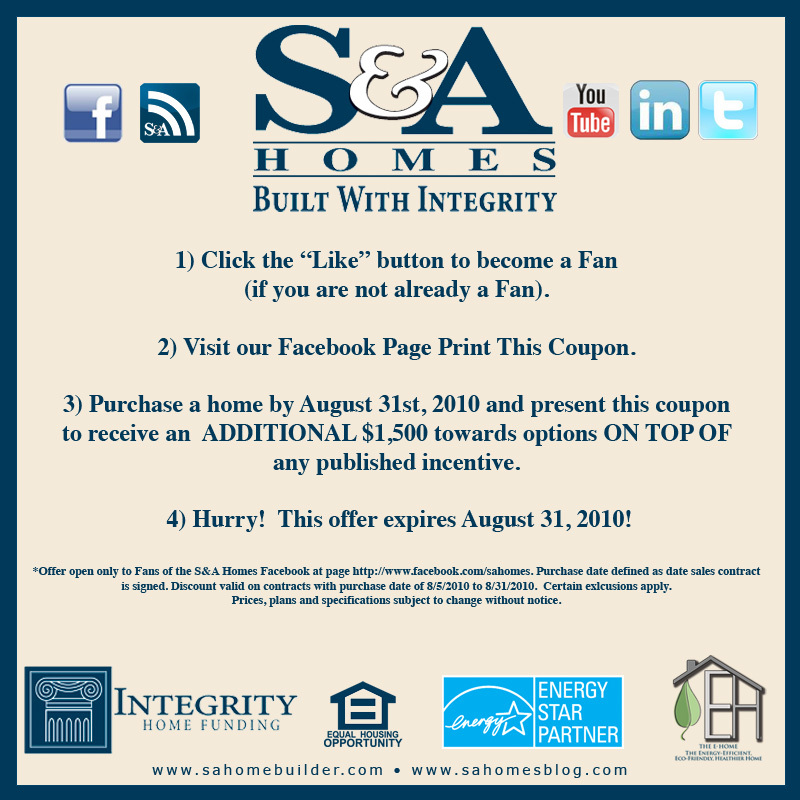 Savings are just a click away for buyers of Central Pennsylvania Builder, S&A Homes. Simply take time away from your normal Facebook gaming and networking to ‘like’ the S&A Homes Facebook fan page. Then, purchase your S&A Home between August 1 and 31, 2010, and you will receive an ADDITIONAL $1,500 toward upgrades on top of any advertised incentive. Today’s homebuyers who are seeking energy efficient home buying solutions at an affordable price are in luck with E-Home from S&A Homes. The S&A Homes E-Home program is focused on building high performance homes that combine energy efficiency, eco-friendly building materials and indoor air quality solutions, all at the best value in the market. 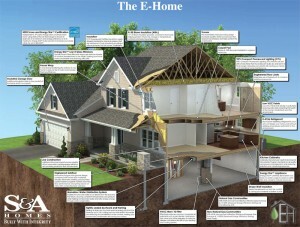 Each home built by S&A Homes exceeds stringent Energy Star standards set by the EPA (Environmental Protection Agency). By employing a “whole-house” systems approach, S&A Homes ensures that every home delivers thousands of dollars in savings to its homeowners, equivalent to reducing a homeowner’s mortgage amount by up to $30,000 over the life of the home. Every home is built with a high-performance HVAC System, Energy-Star Ultra Low-E Glass windows and 90% Compact Fluorescent Lighting (CFL) fixtures and is then checked by an independent energy-rater to ensure the builder has tightly sealed all entry and exit points from the home, the main cause of energy loss in today’s homes.